Driving down Pacific Coast Highway, most people don’t pay much attention to the inland side of the road. They’re too busy looking at spectacular views off the coast. However in some cases it pays to pull your eyes from the scenery. Malibu Seafood on PCH is one of these cases. Their specialty is their delicious fried fish. That’s right—it’s a fish and chips lover’s paradise. From the deep fryer, you can choose one piece, two pieces or three pieces of "fish and fries." Not in the mood for fried fish? No problem? There are plenty of other options, including a menu’s worth of other fried seafood, but my favorite is the fish. But if the perfect golden crispiness of the fryer is a bit too much for you, try the fish tacos or the seared-to-perfection grilled fish, which include ahi tuna, albacore, red snapper, mahi mahi and a lot more. If you’re in the mood for crab try their crab salad with big chunks of crab and not much else. Most of the menu runs from $6 to $12 per entrée. Not only is the food great, but it’s a really great place to have a nice relaxing dinner and just hang out. The main eating area is a large patio with picnic tables and a spectacular view of the water. It’s also very casual. Strings of lights line the ceiling and there’s a condiments table with ketchup and self-serve salt and pepper packets. 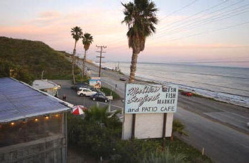 If you’re looking for a delicious, casual dinner right on the water, check out Malibu Seafood. Apparently Adam Sandler likes it too. Last time I was there, I saw him and his family leaving. So if you don’t trust my opinion, at least you can trust Adam Sandler’s.